These hands are ninety-three years old. They belong to Charlotte Marie Bradley Miller. She was so frail that her grand-daughter had to carry her onto the set to take this photo. It’s a close-up. Her emaciated arms emerge from the top corners of the photo and the background is black, maybe velvet, as if we’re being protected from seeing the strings. One wrist rests on the other, and her fingers hang loose, close together, a pair of folded wings. And you can see her insides.The bones of her knuckles bulge out of the skin, which sags like plastic that has melted in the sun and is dripping off her, wrinkling and folding. Her veins look as though they’re stuck to the outside of her hands. They’re a colour that’s difficult to describe: blue, but also silver, green; her blood runs through them, close to the surface. The book says she died shortly after they took this picture. Did she even get to see it? Maybe it was the last beautiful thing she left in the world. 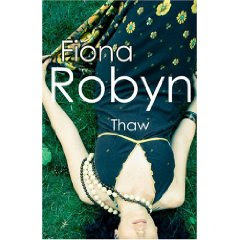 To celebrate Fiona Robyn's book being published online I am happy to offer my gently used copy of Thaw in a competition. The competition will end on Wednesday 10th March at 12 midnight - GMT. This competition is only open to followers of this blog, so if you are not a follower, you need to click on the pretty mosaic of faces above and join or attach me to your Google Reader. It is an international competition, so anyone can enter. All you have to do is leave a comment with your email address, so I can contact you if you win. That is it. Good luck. It sounds so interesting, not sure how I missed this post :) Would love to enter please Vivienne thanks for the chance. I always kept a journal as a teenager but for some reason stopped when I was 16 or so. Funnily enough I had just started to write one every day again when I discovered blogging which kind of took over though I still use my journal from time to time as a form of therapy, to work things through mainly. Sounds like a rather bleak read but I'm guessing this novel will also be one of those that at the same time is rather inspiring. My advice to the writer would be carry on with your journal AND GET A CAT! Please include me in your competition. I'm a follower who would be delighted to own this book.